Tanzania is the largest country in East Africa, and it is considered one of the oldest places on Earth that have been continuously inhabited. As a tourist, you can do many things in Tanzania, but none of them even begin to compare with the safaris. The Great Migration of Serengeti is considered one of the world’s most fascinating phenomena. It is when millions of animals start a one year journey seeking food, water, and a safe place to breed. Apart from that, let’s not forget that Kilimanjaro is in Tanzania, and if you want, you can enjoy the beaches around Zanzibar and Pemba. Before you travel to Tanzania, you need to inquire about the visa requirements. According to Tanzania’s visa policy, there are many visa-exempt countries, and their citizens can enter Tanzania and stay for up to 90 days. 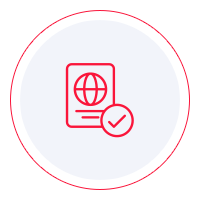 At the same time, visas on arrival are available for eligible nationalities, but the length of the say is determined at the point of entry. All the other nationalities must visit the nearest diplomatic mission of Tanzania and obtain a consular visa. If you wish to find out in which category of travelers you fit in, you can take a look at Tanzania visa policy yourself. However, we suggest that you use iVisa Visa Checker. It is a simple tool that tells you what you need to know in just a few clicks. First, you need to access the feature by clicking on the Visa Checker in the top right corner of this page. Then, you must select your country of origin from the drag-down menu on the left and add Tanzania in the box on the right. The result will tell you if you need a Tanzania visa, and if you do, you will be provided a list of the nearest embassies. iVisa cannot process Tanzania visa applications because electronic visas are not available. Nevertheless, we would still like to be of assistance, which is why our support service is at your disposal 24/7 and is free of charge. When the Visa Checker lets you know that you, indeed, need a visa for Tanzania, you must read about the requirements. You have the option of doing that online, but we recommend caution. That is because the information you find online is not always the most reliable. As an alternative, we advise you to call the diplomatic mission and ask about the requirements. It is the most legitimate source of information. In the meantime, what we can tell you is that all applicants must have a valid passport that does not expire for at least another 6 months from the date of arrival or one month after the intended stay. We regret that we cannot help you any further with getting your Tanzania visa. We hope that the information above is useful and that you have a hassle-free application process at the diplomatic mission.